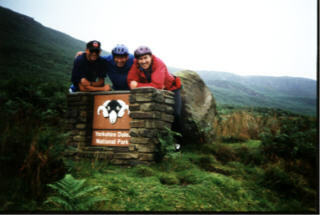 AWOKE AT 7 15AM TO RAIN AND MORE RAIN, BUSIED ABOUT, COLIN AND KAREN ARRIVED 9AM ish; BIKES LOADED EN ROUTE TO SKIPTON.A WET MISTY RIDE OVER TO SKIPTON. 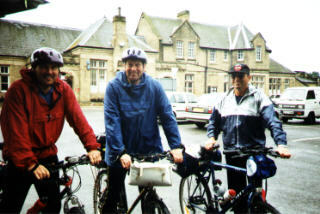 10:30 AM ARRIVED AT SKIPTON, GRAEME AND CHALKY A COUPLE OF MINUTES BEHIND. BIKES LOADED AND SORTED KAREN VIDEOING OUR EVERY MOVE. SURPRISINGLY THE WEATHER EASED ALTHOUGH A FIREMAN NEXT DOOR AT THE FIRE STATION TRIED HIS BEST TO DRENCH US WITH A MIS DIRECTED HOSE. ALTHOUGH I DID HAVE TWO ADJUSTMENTS IN THE FIRST TWO MILES, GRAEME AND COLIN PASSING QUIPS LIKE I THOUGHT WE WERE ON A BIKE RIDE NOT A BUNGIE JUMP AND PASS OUR MALCOLM ANOTHER PIECE OF STRING WE'VE DONE ANOTHER MILE. THE WEATHER WAS OVERCAST BUT PLEASANT. EASTBY FIRST BIG PUSH, ONTO THE TOPS. COLLISION GREAT HILARITY FROM GRAEME AND COLIN. PAST BARDEN TOWER AND THEN A STEADY RIDE OVER TO APPLETREEWICK. THROUGH BURNSALL TO THORPE GOT SLIGHTLY LOST TAKING THE DOWNHILL OPTION IN THORPE, THEN HAD TO WAIT 5 MINUTES TO AVOID SEVERAL RAMBLERS WHO WE DID NOT WISH TO PASS TWICE STEADY RIDE UP AND DOWN TO CRACOE, DEVONSHIRE ARMS 2PM, A PINT OF JENNINGS. 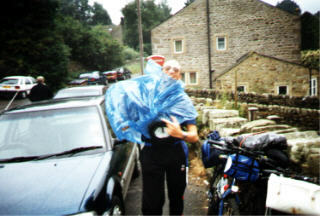 RE START 2:15 ALSO THE RAIN STARTED, IT GOT HEAVIER AND HEAVIER AS WE CYCLED THROUGH HETTON, AIRTON, AND KIRBY MALHAM, THE EASIEST PART OF THE RIDE IT HAD TO THROW IT DOWN, GRAEME SAID I LOOKED LIKE AN ITENERANT KNIFE GRINDER WITH ALL MY BUNGIES AND BITS OF STRING HANGING OFF THE BIKE. BEANS ON TOAST AND A CUPPA AND PLANNED HOW TO RESOLVE OUR PREDICAMENT. 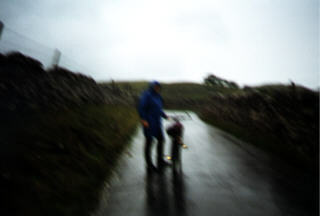 8 MLS TO SETTLE SO WE PUSHED AND PUSHED OUT OF MALHAM IN POURING RAIN. NO ITS NOT A POOR PHOTOGRAPH THE WEATHER REALLY WAS THAT BAD. IT WAS BLOODY HARD GOING WE EVENTUALLY MADE IT TO SETTLE. GRAEME RIDING WITH THE TYRE JUST ON THE RIM, HE SAID IT WAS LIKE PEDALLING IN TREACLE. COLIN WATCHING THE REAR WHEEL SO IT STAYED CENTRAL. ON THE TOP OF MALHAM THE WEATHER EASED SLIGHTLY. I RODE INTO A PUDDLE WITH A DEEP HOLE AND SLIGHTLY TWISTED MY FRONT WHEEL. 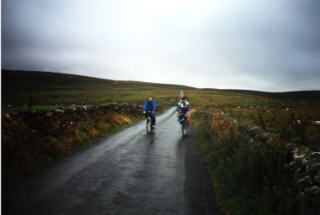 WET AND COLD WE ALL LIMPED INTO SETTLE GRAEME SOUNDING LIKE A GALLOPING HORSE. 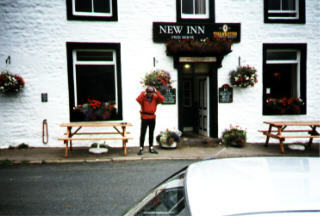 FOUND THE DIGS, DRY CLOTHES, AND A BREW - SORTED 4 PTS OF THWAITES COTTAGE PIE IN THE GOLDEN LION 10:40PM BED FINGERS CROSSED FOR A BIKE SHOP IN SETTLE, PLUS FINE WEATHER? ?